NOVEMBER/DECEMBER 2017 | www.broadbandcommunities.com | BROADBAND COMMUNITIES | 13 technology, including sufficient virus, spam and DDoS protection. 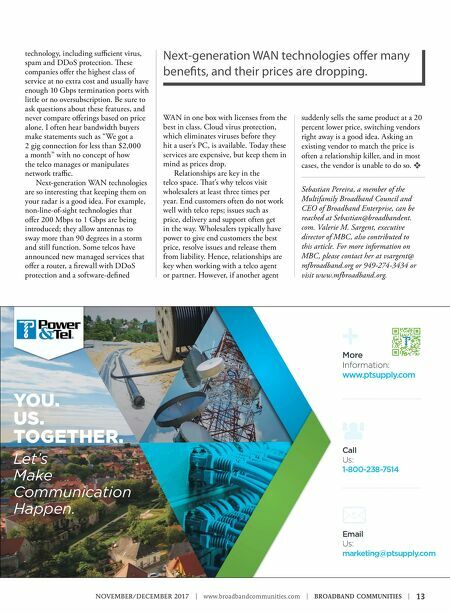 ese companies offer the highest class of service at no extra cost and usually have enough 10 Gbps termination ports with little or no oversubscription. Be sure to ask questions about these features, and never compare offerings based on price alone. 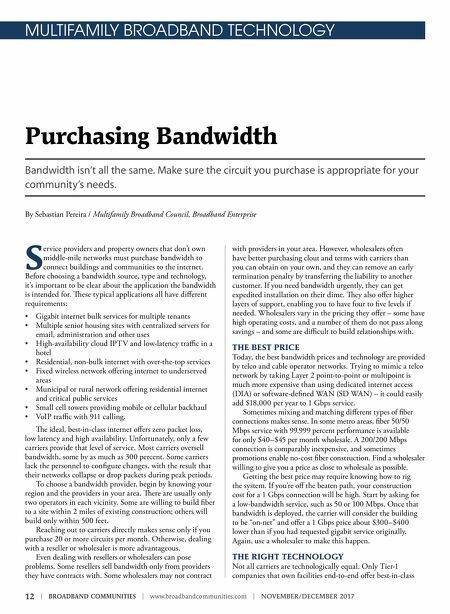 I often hear bandwidth buyers make statements such as "We got a 2 gig connection for less than $2,000 a month" with no concept of how the telco manages or manipulates network traffic. Next-generation WAN technologies are so interesting that keeping them on your radar is a good idea. For example, non-line-of-sight technologies that offer 200 Mbps to 1 Gbps are being introduced; they allow antennas to sway more than 90 degrees in a storm and still function. Some telcos have announced new managed services that offer a router, a firewall with DDoS protection and a software-defined WAN in one box with licenses from the best in class. Cloud virus protection, which eliminates viruses before they hit a user's PC, is available. Today these services are expensive, but keep them in mind as prices drop. Relationships are key in the telco space. at's why telcos visit wholesalers at least three times per year. End customers often do not work well with telco reps; issues such as price, delivery and support often get in the way. Wholesalers typically have power to give end customers the best price, resolve issues and release them from liability. Hence, relationships are key when working with a telco agent or partner. However, if another agent suddenly sells the same product at a 20 percent lower price, switching vendors right away is a good idea. Asking an existing vendor to match the price is often a relationship killer, and in most cases, the vendor is unable to do so. v Sebastian Pereira, a member of the Multifamily Broadband Council and CEO of Broadband Enterprise, can be reached at Sebastian@broadbandent. com. Valerie M. Sargent, executive director of MBC, also contributed to this article. For more information on MBC, please contact her at vsargent@ mfbroadband.org or 949-274-3434 or visit www.mfbroadband.org. Next-generation WAN technologies offer many benefits, and their prices are dropping.